If you’re looking for a flexible, reliable, and low-cost current supply for PCBs, W+P is the right place. 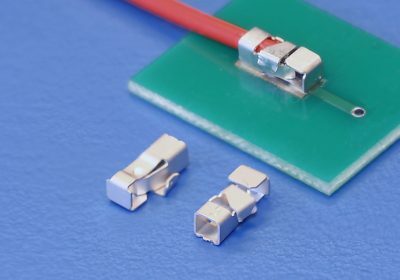 The product portfolio has been expanded with an SMT terminal as a single contact, which ensures a direct connection with simple handling, since additional soldering is not required. The new 5940 series offers an interface as a detachable connection on LED PCBs and for industrial applications. This secure current supply is equipped without a housing to avoid excess component dimensions. Positioned directly on the PCB, the SMT terminal is attractive thanks to its easy handling and removing ability, even at high currents! In addition to the low installation height of 3 mm, the flexibility of the design and a good price are clear advantages! The new single contact from W+P is suitable for both tin-plated multi and single strands. Equipped with srewless-type lockings, they are suitable for cables with wire cross-section ranging from AWG 18 to AWG 26. The current rating level is 12 A (AWG 18), or 5A (AWG 26). The contact material consists of phosphor bronze and the contact surface is matte tin over nickel. Mechanical durability of at least five mating cycles is ensured. The terminal is designed for contact resistance < 20 mΩ, and reliable functionality is guaranteed in a temperature range from -40°C to +125°C. The 5940 series is delivered taped on reel for automated processing.